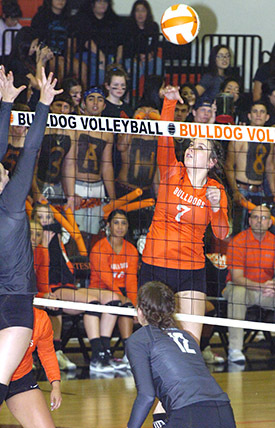 After the opening game of their District 4-AAAA match against Goddard Tuesday at Bulldog Pit, things seemed to be en route to progressing much the same way they had in Artesia’s three other meetings this year with the Rockets. But as any coach knows — particularly in the southeastern corner of the state, where district opponents often end up playing one another ad nauseam through the course of the season — the more you face a team, the harder it becomes to maintain intensity. The Bulldogs jumped out to a quick and commanding lead in the opening bout Tuesday but let up a bit in the latter stages, allowing Goddard to turn what hadn’t been a close game into one. Artesia was able to preserve the 25-21 win, but apparently, the late burst of momentum was enough to subsequently propel the Rockets to three consecutive victories (25-16, 25-20, 25-20) and a 3-1 win. The loss was Artesia’s first in district play and moves them to 4-1 as they prepare to close out the second season Thursday against Portales at home. “That momentum from the end of the first game really helped (Goddard) win the second game,” Artesia head coach Alan Williams said this afternoon. “We just didn’t have any momentum the second or the third game. Malori McSpadden finished Tuesday’s match with 10 kills and six blocks, Paityn Houghtaling added six blocks, and Kyrah Gonzales posted 21 assists. Dezaray Boyce served up a trio of aces, and Sadie Ramirez logged 23 digs. It’s doubtful any of the Rockets’ current players were a part of the team the last time Goddard defeated Artesia around for seasons ago. Particularly to fall at home despite the support of a raucous crowd was frustrating for Artesia but is something the team will have to put immediately in their rearview. “We had everything we needed to win, that’s for sure,” Williams said. “We had a lot of good support last night, and we’ve had a string of success against Goddard, which makes it a little tougher on us and a little sweeter for them, I guess. The ‘Dogs defeated Portales in three straight in their first meeting and will need a similar result this week in order to force a playoff with Goddard for the district title. “We’ve put ourselves in a position where we have to win Thursday, so our focus right now is just on that, and then we’ll let the other things take care of themselves,” Williams said. “The last time we played them, we did a lot of good things. We had different players hitting from different places, so we were very unpredictable, and that worked out for us.